You have a for sale sign in front of your home for sale in Southeast Michigan. Even though the real estate market is slow, you still see other houses being bought. What’s the matter with yours? Why is your home still sitting on the market? Is it you? Is it your home? Is it your agent? It may just be your online marketing (or lack of it). Finally, ask yourself, if a picture says a thousand words, what are the photos of my home saying? If your pictures don’t look friendly and inviting, and if they don’t make your home look its very best, you might as well take your home off the market. Don’t forget to add important information. Think about it. How many other homes are being sold online? What makes yours better/different? In other words, why should a buyer take the time to look at your house in person? Buyers aren’t mind readers. They can’t look at a picture and see that your home has 4 bedrooms and 2.5 baths. You have to tell them that. If your house also has a large backyard, walking paths nearby or green home features, by all means, brag about it. Do use a lockbox, so you don’t have to be there for an agent to show the house. Don’t set restricted hours. This makes showing the home at the buyer’s convenience difficult, and you definitely want it to be convenient for your potential buyer. If you want an agent who will market your home for sale in Southeast Michigan to its best advantage, give me a call me today at 248-514-2640 or email me at info@NorthWoodwardHomes.com. Trying to sell your Bloomfield Hills real estate in a slow market can be frustrating. You may find that it takes longer to sell and you can’t get as much money as you could during a booming market. However, you can’t believe all the hype about a sluggish real estate market. Do your research and separate the facts from the fiction. 1. You won’t get a decent price. Your Bloomfield Hills real estate will sell for whatever a buyer is willing to pay. A comparative market analysis shows you what other buyers spent on property like yours. Of course, if you bought your home when values were up, you may not get the return on your investment you’d hoped for. However, most sellers get a fair price and even make a profit in a slow market. 2. Your Bloomfield Hills real estate will stay on the market too long. While it’s true that real estate tends to take longer to sell during a slow market, it’s not impossible to sell. People still buy in slower markets. If your home is priced right, prepared for sale and marketed professionally, it will sell. 3. Buyers only want foreclosures and short sales. The truth is that buyers want good deals, and this can be in the form of money or time. The price of a foreclosure or short sale may certainly be attractive, but they can take a considerable amount of time to close while the banks negotiate their terms. Paying slightly more for a traditional sale is sometimes well worth the time they can save. Using my proven marketing plan, I can help you sell your home whether it’s a slow market or a booming market. Call me today at 248-514-2640 or email me at info@NorthWoodwardHomes.com. Setting the asking price for your home for sale is one of the most important decisions a Southeast Michigan real estate homeowner has to make in the selling process. Why is it so important? 1. You only get one chance to make a good first impression. With so many competing Southeast Michigan homes for sale, yours has to pop out immediately as a good value or buyers will move on, unlikely to return. You get one stab at your home’s debut, and it’s easy to blow it. 2. Set the price too high and you could hurt your chances of selling your home. The amount of traffic a home gets in the first week on the market is about 5 times what it gets the following weeks. The traffic continues to decrease every week. You might say, “Well, I’ll just lower my price.” This hurts almost as much as it helps. It conveys to buyers (the few who are still considering your home) that your home was overpriced and may still be. 3. Setting the price too low can be almost as harmful. Buyers who are looking in a specific price range may not consider your home because of the low price tag. They assume it will not fulfill their needs or worry that there’s something wrong with it. 1. Neighborhood sales prices: Recent closed sales in your immediate neighborhood offer the most pertinent data for predicting the sale price of your home. List prices of homes still on the market should be taken into consideration also, because they show the current pricing trend. A professional Southeast Michigan real estate agent will do all this research for you as part of their services. 2. Condition of your home: If your home has been better maintained, is more up to date and shows better than the other homes for sale, it will sell faster and for more money. Updates, even those as minor as having current paint colors, impact pricing. Updated kitchens and baths are especially important to buyers. Are you ready to sell your Southeast Michigan real estate? Let me do the research for you and help you set the best price to get your home sold. Call me today at 248-514-2640 or email me at info@NorthWoodwardHomes.com. Are you buying Troy Michigan real estate chiefly as an investment or as your primary residence? Does it need a little updating or a big overhaul? When you consider that buying Troy Michigan real estate is a major purchase, no matter what the reason, it’s always a good idea to look at the potential pros and cons. Cost – It’s almost always cheaper to buy something broken than to buy something that works. Well, the same can be true for any kind of real estate investment. Buying a fixer upper may be a good alternative, if you want to own a home but can’t afford a high mortgage payment. Style – It’s your home. When you remodel, redecorate or renovate, you get to choose what you want it to look like. Maybe it has a big picture window just dying for a window seat. Maybe you like soft mauve walls instead of the institutional green currently there. That’s okay, because you can fix it up to fit your personal style. Cost – You may be able to save money on the selling price of a fixer upper, true. However, the savings could be totally lost once you start looking at the cost of renovations. Before you sign on the dotted line, do what any homebuyer should do and get a home inspection. Figure out how much you’ll be spending all together instead of basing your costs exclusively on the selling price. Location – Often, fixer uppers are in less than pleasant neighborhoods or on streets with other homes in equal disrepair. Especially if you’re flipping houses, the chance of getting your investment back isn’t very likely. When buying a fixer upper – for any reason – make sure you weigh its location against the cost. Style – Quite simply, your personal style might take more energy and knowledge than you have available. For instance, if you don’t know anything about drywall, plasterwork or woodwork, that window seat you want so badly may not be possible. As well, if you only have an hour or so a day to work on the home, it could be in a state of disrepair for a long time before it’s finished. If you’re thinking about buying fixer-upper Troy Michigan real estate, always look at the pros and cons of the specific house. You could make a great investment or end up with a money pit. If you’re looking for a fixer upper that needs some tender loving care, I can help. Call me at 248-514-2640 or email me at info@NorthWoodwardHomes.com for more information. If you’re looking for one of the homes for sale in Southeast Michigan and you’ve never bought a home before, you might think, “This won’t take much time.” Typically, just the opposite is true. Buying a home frequently takes quite a bit of time. 1. Weigh the Benefits – Before you actually go house hunting, weigh the pros and cons of buying a home. Can you really afford it? Is it a good idea, or are you caving under pressure from family, friends, your doctor and the next-door neighbor? Make sure that you’ve actually considered the alternatives and decided home ownership is the best move for you. In my experience, homebuyers who are sure they’re ready to buy not only enjoy the process more, but also are more likely to enjoy the home they buy. 2. Define What You’re Looking For – Before you walk out the door to look at homes, figure out your goals. How do you do this? Begin on the internet. Between virtual home tours, online listings, photographs and aerial shots, you’ll be able to build a much stronger idea of the type of home and neighborhood in which you want to live. Once you go through this process, you’ll have clearly defined goals you can then pass on to the buyer’s agent you hire. You are now halfway to home ownership! 3. Lay Off the Sugar – Before going to look at houses, lay off the sugars. Research shows sugar can inhibit your short-term memory. You want to be able to remember the homes you’ve seen. Having said that, your agent probably won’t show you 15 or 20 homes in a day. At the most, you might see 8 or 9. You see, a good agent pays attention to the goals you told him or her on the first day. The only homes you need to see are those that fit your goals. 4. See Your Favorites Before Buying – Okay, you’ve looked at 14 homes, and you’re torn between houses 2, 5 and 6. Since you’re only buying one house, you want to make sure you get the home you want. Therefore, before signing or making any kind of commitment, look over the ones you like the most again. You’ll see things you may have missed before, which will help narrow the choice down to one. Buying a home for sale in Southeast Michigan is one of the biggest steps you’ll ever take. It’s a big investment, and the process can be time consuming. However, following the above steps can make owning the home of your dreams less of a hassle and more of a dream come true! If you’re looking for a professional buyer’s agent who can help you find the home of your dreams, give me a call at 248-514-2640 or email me at info@NorthWoodwardHomes.com. Today’s slow Southeast Michigan real estate market is a hard place to sell homes. However, the fact remains that homes are still being bought and sold. Buyers are out there; you just have to attract them to your home. Selling homes isn’t a quick or easy endeavor. Especially now, aggressive marketers are the winners. Taking the time to clean and stage your home, as well as create a wide-reaching marketing campaign, can get that for sale sign taken down for good. If you’d like to sell your Southeast Michigan real estate, let me create a strong, wide-reaching marketing campaign to get your home sold. Give me a call today at 248-514-2640 or email me at info@NorthWoodwardHomes.com. This attitude, especially in a slow real estate market, has left many a seller empty-handed. They say “no” when they should have said “yes.” They have all these reasons why they won’t “A, B or C,” rather than just doing “A, B or C” for their home for sale in Southeast Michigan. If you have a home for sale in Southeast Michigan and it’s been on the market for a while, you may have said “no” to too many things. Take some time to look at what you can do to market your home better. These pointers may very well make all the difference! If you’re trying to market your home and need a professional, I can help. Call me at 248-514-2640 or email me at info@NorthWoodwardHomes.com for more information. You’ve repaired, de-cluttered, deep cleaned and polished your Royal Oak Michigan home for sale until it shines. But how do you keep it that way when you and your family have to live in it every day? 1. Decree some rooms off limits. There are a few obvious rooms that can easily be declared off limits such as the formal dining room and living room. But there are others you may not have considered. If you have 3 bathrooms, proclaim 1 or 2 of those bathrooms off limits. Have a guest room but no guest? Shut the door and forget it. 2. Hire a maid service. You may not be able to afford a cleaning crew on a regular basis, but to reduce your stress while your Royal Oak Michigan home is for sale, consider hiring a housecleaner to come in once or twice a month. 3. Leave your shoes at the door. Sure, it’s inconvenient, but it really does keep your floors clean much longer which means less vacuuming, sweeping and mopping. 4. Clean as you go. Anytime you get something out, put it away when you’re done with it. Persuade every member of your household to do the same. 5. Use potpourri. You may have read some tips I’ve given about baking cookies to make your home smell great for showings. That’s an excellent idea for people who have lots of time or just love to bake. But for the rest of us, put out a bowl of cinnamon scented potpourri and avoid cooking smelly foods such as liver, fish or anything fried until your home is sold. If you can’t do without your fish, go out to eat. Need to sell your home? Let me help you get it sold so you can relax. Call me today at 248-514-2640 or email me at info@NorthWoodwardHomes.com. It’s time for some tough love, here. 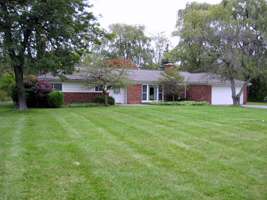 Your home doesn’t fit in with other Royal Oak Michigan homes for sale. It doesn’t play well with others. When you put it on the market, you priced it more than 8% higher than the other Royal Oak Michigan homes for sale. Frankly, it’s a market bully. There is no longer a federal tax credit to entice buyers and get them interested. Your house is competing with several foreclosures – many of which are priced as low as the lender can handle. The longer your house sits on the market, waiting for a buyer, the harder it will be to actually attract a buyer. There is a very little incentive for buyers to go out and buy now, especially higher priced homes. Mortgage rates are low, but lender qualifications are much tighter now. Any seller hitting the market in today’s economy has two choices: wait or cut your losses. They aren’t pretty choices, but life is seldom convenient, no matter what commercials say. If selling your home isn’t an absolute necessity, consider the fact that it might serve you better to hang in there. If you don’t have a compelling reason to put it on the chopping block, don’t. If you must sell your house, don’t let it be a market bully. Price it according to the local market, not the price of a home across the country. In this case, you want your house to be part of the “in” crowd. Listen to your real estate agent’s advice and use the data he or she provides in the Comparative Market Analysis to set the best price. With the way the economy is now, you can bet that owners of competing Royal Oak Michigan homes for sale are serious about selling. The competition is tough, so, when pricing, be kind to your home and price it low enough to sell. If you’re ready to sell your home, I can help get it sold. Call me at 248-514-2640 or email me at info@NorthWoodwardHomes.com for information.